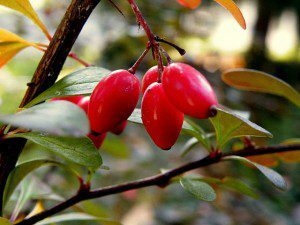 Japanese barberry, (Berberis thunbergi), arrives in the woods by birds eating the fruits in winter and pooping/planting them. It can grow in full shade and established woods. Nobody, (especially not deer), eats the leaves or the prickly twigs. It can root where branches touch the ground and where seeds are dropped in place to make eventually an extensive, dense cluster. Its leaves break down quickly and raise the nitrogen level in the soil, encouraging earthworms and discouraging native woods plants. It offers mice shelter from predators, encouraging them to congregate and share germs. Its dense foliage keeps the area underneath it moist so that ticks can be active almost all the time. So that’s why I pull barberry at Fraser Preserve every January & February. 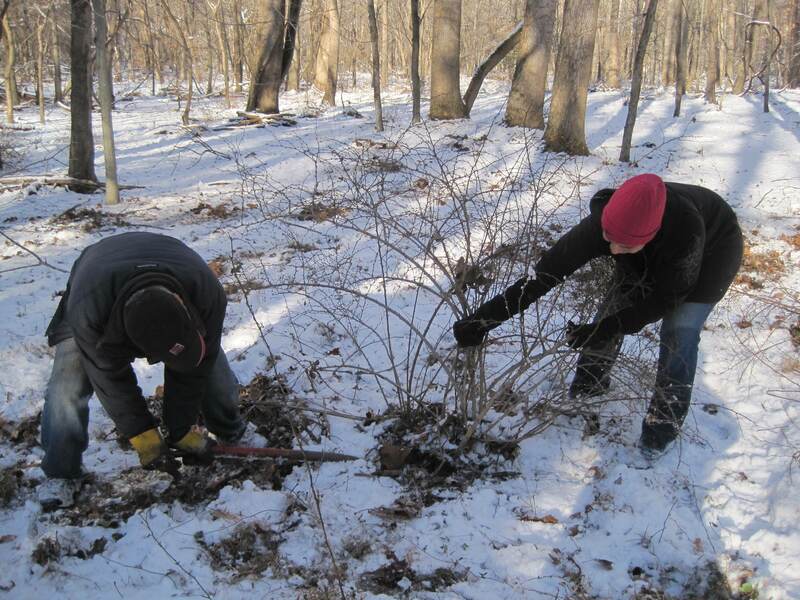 Potowmack chapter removes barberry at Fraser last year. A little snow is helpful, but you can’t pull barberry if the ground is frozen. I’ve often said that we can work with snow on the ground. Snow actually insulates the ground and keeps it from freezing; it also increases contrast and helps you spot the small barberry sprouts. But we can’t work when the ground is frozen. Last year I had to cancel half the work sessions I’d scheduled because of frozen ground: you just can’t pull plants from frozen ground. The tops just break off and leave the crown of the plant behind, which leaves it alive and harder to pull the next time you try. Other years only one or two scheduled workdays have had to be cancelled: we really don’t get a lot of ground freezing around here, especially not in the woods with a good layer of leaf litter. The barberry at Fraser is not found in bare ground locations where the ground would freeze more readily. Barberry is what Alan, (Alan Ford, Potowmack Chapter President), calls a “crown plant:” you kill it by removing the junction between the topgrowth and the roots. Often it’s easiest and causes less soil disturbance if you clip the roots and just remove the crown. It does not grow back from bits of root left in the ground. It does grow from seeds dropped under larger plants, so that it is very worthwhile to return to places where there were large plants or patches to pull sprouts until the seed bank is exhausted — I don’t have statistics on this, but most of them are gone after 3 years of sprout-pulling. So why is it that Lyme ticks are more often found where this invasive plant is not present? So where barberry was absent, there were the lowest number of Lyme infected ticks. The research is has been extensive on this point, if you would like further corroboration, check out the several links Margaret provided. I have had good results eliminating Japanese Barberry here in SW Virginia and on property near Asheville, NC, by cutting back the tops and painting the stumps with concentrated Roundup. I apply it with an old shoe polish bottle with a brush top. This fits well in my pocket and is easy to carry while I work. I work in the warm months when the sap is running in the bushes to carry the Roundup to the roots. Thanks, Pam, that is also a good way to go. The winter work has the advantage of being able to avoid using the herbicides. Thanks fro your comment and your efforts to keep Japanese barberry out of our ecosystems! Is there a product that can be sprayed on a barberry bush before it grows leaves in the spring – a product that prevents leaf growth; like a pre-emergent prevents seeds from sprouting. I understand that there are defoliants that kill leaves and deny roots the chlorophyll they need to thrive but is there a way to prevent leaves from growing so I don’t need a defoliant. Is there a way to prevent leaf buds from sprouting? And the deer ticks are on the wind now. once the branches, crown, and roots are removed, how should you dispose of these so not to inadvertently spread this tick habitat? Is burning barberry in winter an option? If so, what is the best technique?